Size: 17 7/8 x 14 3/8. 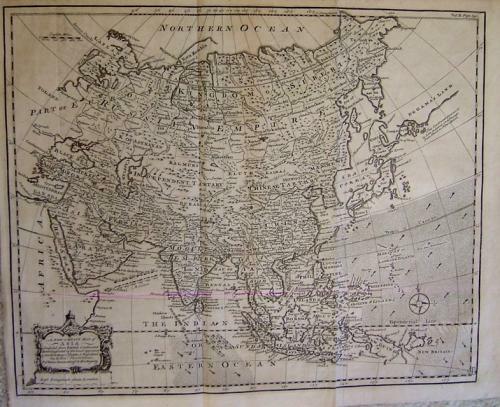 Title: A New & Exact Map of Asia Compiled from Surveys and authentick Journals, assisted by the most approved modern Maps and Charts, and Regulated by Astron'l Observations. An attractive map showing the full expanse of Asia. Just east of Japan is a coastline marked De Gama's Land. Title vignette and compass rose. An interesting feature is the longitude lines that are mis-marked by 10 degrees at the top and bottom. In very good condition, linen backed.